A wild donkey once lived in the woods. He had no friends and lived all alone. One day a jackal passing by saw the donkey. He went up to the donkey and said, “What is the matter? Why do you look so sad my dear fellow?" The donkey turned to the jackal and said, “I have no friends and am very lonely." “Well, don't worry. I will be your friend from today," the jackal comforted him. From that day, the donkey and jackal became very good friends. They were always seen together. One moonlit evening, the jackal and the donkey were strolling through the woods. It was a cool and pleasant evening. As they walked on, they came to the outskirts of a village bordering the woods. There in front of them was a grove of fruit trees. “Ah. Look! How wonderful and delicious the fruits look," said the donkey. “Let’s eat some of them." “Okay," said the jackal. “But let’s do it very quietly." They entered the grove and silently started to eat the fruits. After eating enough, they lay under a tree happy and content. “That was delicious, but there is something missing tonight," said the donkey. “What is that?" asked the jackal. “Why, music of course," answered the donkey, looking a little surprised. The jackal asked, “Where are we going to get music from?" The donkey said. “Don’t you know that I am an accomplished singer?" The jackal was alarmed. "Remember, we are in an orchard. If the farmer hears us, we will be in trouble. If you want to sing let us go away from here," he advised the donkey. "You think I can't sing, don't you?" asked the donkey in a hurt voice. “Wait till you hear me." 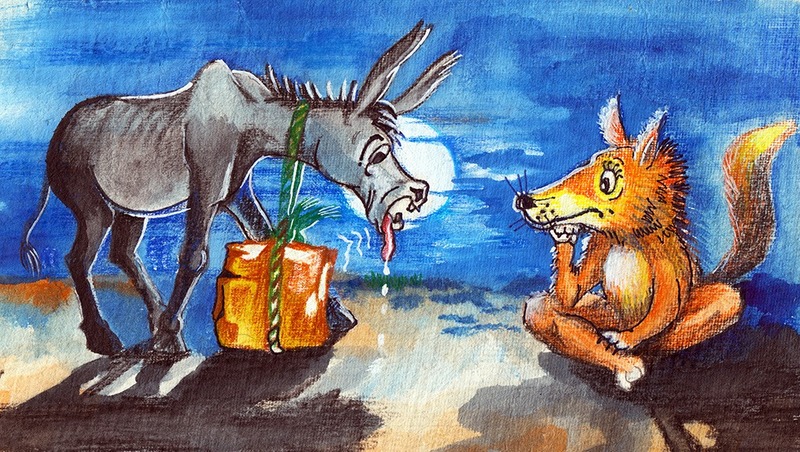 The jackal realised that the donkey was not willing to take his good advice. He moved away and hid himself behind a clump of trees. The donkey threw back his head and started his song. “He …haw, hee-haw," he brayed aloud. The farmers hearing the loud braying came rushing with sticks and gave the foolish donkey a severe beating that left the donkey feeling sore all over. After the farmers had left, the jackal went over to his friend. He said. “Is this the prize you won for your singing?" “They don’t appreciate good music," replied a hurt and ashamed donkey. The jackal replied. “This is what happens when you don’t listen to the advice given by a good friend. I hope you have learnt a lesson."